With over 450,000 members, Cointiply claims to be the highest paying Bitcoin faucet on the internet. Is it? More importantly, you may be asking whether Cointiply is a scam or a legit platform. In this review, I am going to explain how Cointiply works and give you my honest opinion about it. Cointiply is a bitcoin faucet, which is basically a reward site where members complete simple tasks in exchange for bitcoins. We can also say that Cointiply is a GPT (get-paid-to), similar to hundreds that exist on the internet today. The main difference is that it pays via Bitcoins and has some interesting ways to multiply your coins, hence the name Cointiply. When you become a member, you will be able to earn coins by taking surveys, completing offers, watching videos, playing games, inviting your friends and more! No, it isn’t. 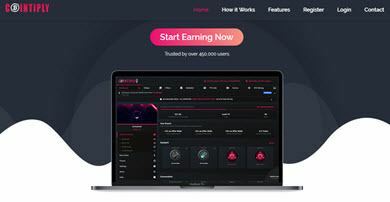 Cointiply is a legit website that has been running since February 2018. If you check out this page on netbusinessrating.com, you will see hundreds of income proofs, which for me, is enough evidence that the site pays. Earn 100 coins as a sign up bonus. There are 20 offerwalls and lots of opportunities to earn coins. It’s a HUGE platform! 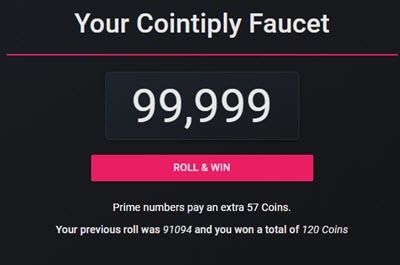 Claim free coins hourly with the Cointiply faucet. The reward amount is very low. Reaching the minimum withdraw amount takes a long time unless you complete some high paying offers. The bitcoin price can drop before you have a chance to exchange for USD. How Much is 1 Coin Worth? Whenever you complete a task on the site, you will earn coins that you can redeem later for BTC or use in the Cointiplay game. Currently, 10,000 coins equal to 0.0002 BTC (approximately 1 USD). The value of a coin can increase or decrease over time depending on the Bitcoin price. Therefore, there is a possibility of winning as well as losing money due to market fluctuations. The registration is free and pretty straightforward. All you have to do is provide your name, email address, choose a password, and you are good to go. As you already know, there are many ways you can earn coins inside Cointiply. My goal here is to explain the main ones briefly, so let’s get started with the Cointiply faucet! The first thing you will notice when you log in is the main Cointiply Faucet, which gives you free coins every hour. 1 – 69,999: 40 coins. 70,000 – 89,999: 60 coins. 90,000 – 96,999: 120 coins. 97,999 – 98,999: 240 coins. 99,000 – 99,998: 560 coins. If you are lucky enough to roll 99,999, you will win the jackpot of 100,000 coins (approx. $100). It’s important to mention that these faucet values depend on your multiplier rate. All members start with a 1.5x multiplier, which can rise or fall depending on how active they are on the platform. The more you engage with their services by completing offers, surveys, etc., the higher your multiplier. The easiest way to earn coins is by watching videos via Smores, Hideout.tv or the Cointiply Video Ads. The cool thing about it is that you can earn money passively even while you are not at your computer! 3 points will be credited for every ad that appears between each video. The reward is very low, but it adds up over time. Cointiply has partnered with 20 offer walls, which are third-party platforms full of opportunities to earn rewards. Popular offer walls include Adscend Media, Tap Research, Adgate Media, Theorem Reach, Minute Staff, and Revenue Wall. You will find numerous survey, free trials, free sign-ups, casino offers and mobile apps and more! I am not a fan of those offers that ask my phone number as I have to agree on receiving marketing calls. Using an alternative number is an excellent strategy to avoid inconvenient calls, but the problem is that some offers only accept landline numbers. In this section, all you have to do is view the ad for a few seconds to earn around 6 – 13 coins. There are not many ads available. Chose any game from a vast selection and earn 35 coins every time your activity bar fills up. Cointiply is a gambling game that you can play to multiply your coins. First, you need to choose how many Coins you would like to wager (10 to 50,000). Every time you select the right target (red Gem cluster), you will earn the number of coins you wagered times the multiplier rate. The multiplier doubles every time you select the right target, so you have the potential to make as much as 613 Coins from a 10 Coin wager. You can stop at any level and take your wins or keep trying. 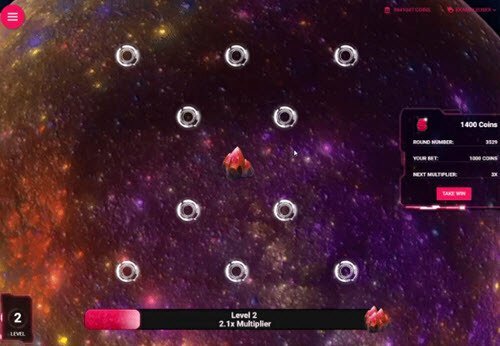 If you select the wrong target (red Gem cluster), you will lose everything. I played this game a couple of times as it’s pretty addictive. Unfortunately, I lost more coins than I won, so I suspected Cointiply had the edge in this game. After reading about Cointiplay on the website itself, I discovered there is a 68.7% chance of winning Level 1 and a 66.7% chance of winning each one of the other levels. However, they do have an edge of approximately 3.75% on the first 2 levels, which means the more you play, the more coins you will lose in the long term. Cointiply’s referral program is okay! You will earn 25% of all your referrals faucet claims and 10% of your referrals offer wall earnings. You can refer unlimited users by sharing your referral link on social media, forums, etc. Earn 1% loyalty bonus every day you log in and make a faucet claim. Earn 5% annual interest if you keep over 35,000 coins in your account. Bitcoin Wallet – The minimum requirement is 100,000 Coins ($10), and the payment is processed one a week, usually on Sundays. DOGE Wallet – The minimum requirement is 35,000 Coins ($3.5), and the payment processed within 24 – 72 hours. FaucetHub – The minimum requirement is 50,000 Coins ($5), and the payment processed within 24 – 72 hours. Faucethub is a good option because you can exchange BTC to USD without fees. Cointiply is probably one of the highest paying faucets out there! Still, the pay rates are too low compared to other ways to make money online! If you are completing surveys and offers, I advise you don’t gamble with your coins. Cointiplay is very risky as the odds are against you. If you are not a fan crypto and you prefer to get paid via PayPal, a great alternative is Prizerebel, my top rated GPT. Now, if you are sick and tired of wasting hours just to earn a few cents, keep reading as I am going to show you how you can make much more using my recommended strategy. In 2015, I was struggling to survive as a minimum wage employee. Working 35 hours per week was not enough to pay the bills and also save for travelling, which is my passion! Thanks to a blog review, I found this excellent program, which showed me the proper steps to make money with affiliate marketing. 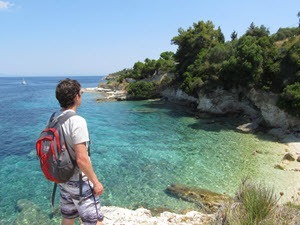 I was blown away with the possibility of making a full-time income while working 100% remotely. In this business, I make my own rules, and I don’t have to handle any customer service! Currently, I am making over $1,000/mo online, which covers all my living costs! If you want to build an internet business that works for you 24/7 and generates excellent affiliate commissions, check out my #1 recommended program. I hope my Cointiply review was helpful to you! today I tried to open it, intending to withdraw but what happened, I couldn’t even find the wab, even though I saved it in the bookmark, when I clicked the description page ptc.cointiply could not be found .. Is this a sign wab already scam …? Hi, the site is opening for me so I think there is a problem on your end. 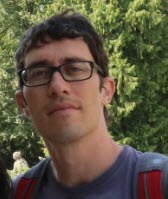 Try opening in another browser or another computer or mobile.